What a weekend. I spent a night in the hinterlands communing with a groovy cat in tiny pants and one cool coyote who gathered together, from far and wide, women with varying opinions but with a few things in common – a great gift for life and a charitable heart that allowed them to share their gifts with me. Laughter, opinions, food and pure joy. I received all those things Saturday night at a blogger get together hosted by Aunt B and Mack. 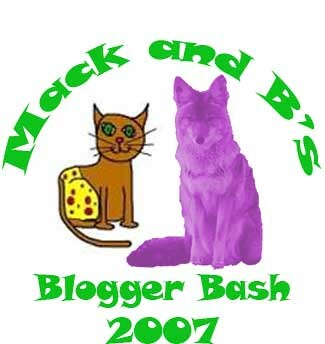 Here are some pics from Mack and B’s Blogger Bash 2007 (rhymes with MacNCheese, it was so tasty, mmmm). Let’s see, I’ve recently covered everything from geriatric music with The Big Joe Polka Show to the more contemporary brassy new release from The Cat Empire Sly to The Dude of the silver screen in The Big Lebowski. Now I take you to the Bard himself, William Shakespeare and his masterpiece Hamlet. I heard this song a couple of weeks ago and even heard the name of the band but my short term memory apparently flushed all that info out the back door about two milliseconds after it entered my tiny squirrel cranium. I’ve been telling Newscoma ever since about this new song I heard and loved and then never heard again accompanied by the pertinent info such as band name or song name. 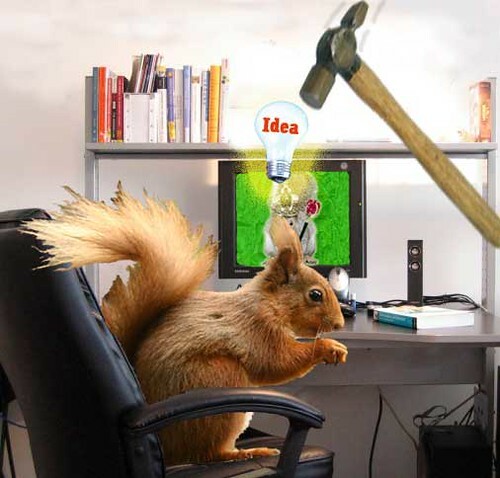 The Squirrel Queen presents for your entertainment …. 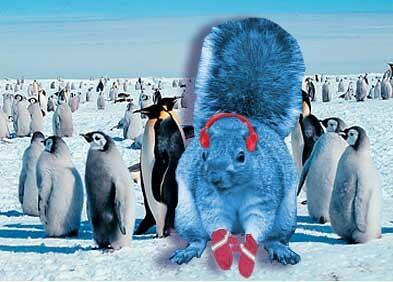 The Squirrel Queen is very tired of being cold and very anxious for spring to return after teasing us last month with almost balmy conditions. If these chilly temps maintain, I may begin to hear the voice of Morgan Freeman in my head narrating my march through everyday life. I have found a new television obsession. No, obsession is not the right word. How about diversion (though I’ll admit this one will be taken in brief and infrequent doses). It’s “The Big Joe Polka Show” available on the RFD-TV network. To put it succinctly, “Wow”. It’s a poorly-produced hour of nonstop polka music with geriatric dancers whirling across what appears to be a plywood dance floor in front of a bandstand filled with accordion players. It looks like it might have been shot either in the ag barn at the local fairgrounds or at the nearest VFW dance hall. The host is a genial fellow, Big Joe, who is always decked out in some frilly-fronted, garishly-colored silken shirt with a vest to compliment the outfit. 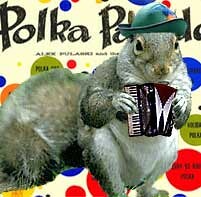 From a bit of research, it seems big Joe is the Polka czar of the USA. This show takes me back to a couple of things from my childhood. First, it’s Saturday evening at my grandparent’s house watching The Lawrence Welk Show on PBS. Seeing Bobby and Sissy dancing around in snappy matching outfits or the Lennon Sisters singing in perfect harmony or the guy tap dancing to some music that was already being piped into elevators 35 years ago. All introduced by Mr. Welk himself with the champagne bubbles drifting in front of the bandstand. Ahhhh, yesterday. I found a Web site that honors the show with an on-going blog of all things Welkian, such as cast members’ birthdays. I’m guessing this is pure irony, but the person in charge of all that goes by the handle JB Funky. Funky = Welk? Wunnerful. The other thing Big Joe’s show reminds me of from yesteryear is SCTV. I can imagine John Candy impersonating Big Joe with Joe Flaherty rocking the accordion as a band leader and Catherine O’Hara as a dancing dervish on the floor with Dave Thomas as her partner. SCTV, of course, had its own polka moment with the Schmenge brothers . And if you make it through an hour of polka on RFD-TV, you’ll be rewarded with classic episodes of The Porter Wagner Show. That’s got to be a whole ‘nother post. So it appears these little old blogs are beginning to get great scrutiny and crawl under people’s skin. Someone endures some crappy service in a business. They write about it on their blog, and BOOM, they get a cease and desist order from a law firm. Wow, seems like freedom of speech is getting pinched once again. Newscoma is on the job, taking time away from her Bigfoot searches and “Lost” rants to keep up with the fallout from these legal actions. For a full list of links on this ongoing story that affects us all, check out her post. Back in ye olden days before Peeps became popular as a microwave jousting product, the Squirrel Queen got a lovely Easter basket every spring. And sometimes she would get a chick or a duck dyed a groovy shade of pink, purple or green which would eventually end up with the chickens producing eggs in my grandma’s backyard. She’d also get lots of rock-hard, marshmallow-filled (I think), candy-coated Easter eggs that had the same general flavor as cardboard or the green grass in the bottom of the basket. Peeps were also included in the gaily colored basket but were not a favorite of the SQ. Jelly beans made an annual appearance but didn’t hang around long because Mom so loved them and bought them in abundance for herself SQ later figured out. There was also a chocolate bunny, most years of the hollow variety with granite-hard, blue sugar dots for eyes. They weren’t white chocolate or dark chocolate or filled with Skittles or Reese’s peanut butter filling. They were milk chocolate, and by golly I loved every single ounce of it that melted in my hands. We dyed our own eggs. The smell of vinegar permeating the house for hours later. If you were lucky you had one of those wax pens that allowed you to scribble a “design” or a name onto the egg. Then we hid them time and time again until they had clanked against each other so frequently in the basket that they were crisscrossed with a web of cracks in the shells and manhandled so many times they were barely fit any more for human consumption, aka future egg salad or deviled eggs. 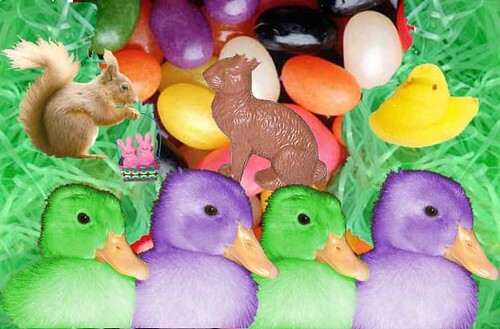 Now, we’ve got delectable Cadbury eggs and candy, oh sweet candy, of so many tasty varieties. Temptation is boundless. How about this concoction … an Easter turducken. I don’t know if I’ll go to the lengths of actually putting one together, but it looks like good, messy, finger-licking holiday fun.